Inabgo Adblue® When used in BS- IV compliant engines increases diesel average By 3 - 4% ! Inabgo when used in engines compliant with BS IV or EURO 4 standards lowers fuel consumption by 3% to 4 %. 5% in the case of engines compliant with the Euro 5 or BS V. Inabgo complies to all requirements of ADBLUE® which is the registered trademark for AUS32 or also called DEF (Diesel Exhaust Fluid) in the USA. This reagent is used with the Selective Catalytic Reduction (SCR) system to reduce emissions of Nitrous oxide from the exhaust of diesel vehicles. Inabgo is a 32.5% solution of high-purity urea in ultra pure water that is clear, non-toxic and safe to handle. It is non explosive, non flammable and also environmental friendly. Inabgo is classified under the minimum risk category of transportable fluids. It is neither a fuel, nor a fuel additive, but is a reagent that needs to be added into a dedicated tank. Use of Inabgo reduces emission of NOX by converting them into Nitrogen and Water, to make our air cleaner and greener for us and our children. The addition of Inabgo is a mandatory requirement in all SCR fitted vehicles to comply with BS-IV (Bharat Stage IV) norms. How much Inabgo do I need? Average consumption of Inabgo is generally 5% of diesel use. You will use about 5 litres of Inabgo for every 100 litres of diesel. Why is Inabgo better than other AdBlue’s® available ? Inabgo is meticulously manufactured only with Highly pure Raw materials having least amount of Biurets, aldehyde and other impurities that block catalysts reaction sites damaging the SCR catalyst. Inabgo is prepared by using only Ultra Pure De-Ionized water which complies to Pharmaceutical grade water. This results in reduction in minerals and other salts that get carried into the SCR System that kill the SCR Catalyst leading to damaged catalyst and very expensive parts replacement to comply BS-IV Norms. Inabgo ensure quality standards which are better than those specified in ISO 22241 (ISO-22241-1, ISO-22241-2, ISO-22241-3) specifications which is the industry standard. Inabgo give COA( Certificate of Analysis) with every batch that is dispatched, which ensures easy traceability. Note :- The AdBlue® trademark is currently held by the German Association of the Automobile Industry (VDA), to ensure that you only buy a reagent for your heavy duty vehicles that bears the name AdBlue® with the registered trademark (®)on the product label. 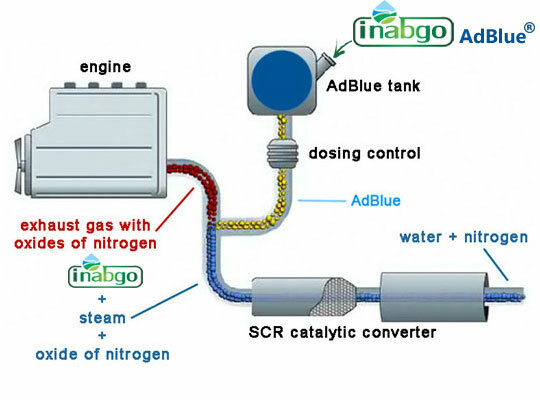 Buying AdBlue from Inabgo is a guarantee of the correct and better specification required for use with your SCR technology.